A research proven programme to help people overcome lower back problems. The Yoga for Healthy Lower Backs course is a specialist yoga programme proven to help relieve chronic low back pain. Backache is a common problem. Now there is an evidence-based way to improve back health and function. The 'Yoga for Healthy Lower Backs' programme is 30% better than usual care. It aims to gently and progressively get sufferers back to being more active again. The University of York (Department of Health Sciences) ran one of the largest research studies into yoga to date, funded by Arthritis Research UK. Teachers from the Iyengar Yoga Association (UK) and British Wheel of Yoga designed and ran specialist group classes in five areas of the UK for chronic back pain. The positive results were published in the Annals of Internal Medicine in 2011. The Cost Evaluation in Spine journal showed that this yoga would be cost-effective for the NHS. This yoga was designed for people who have non-specific, chronic/recurring low back pain. No need to wait until the next back pain episode - begin soon. Learn life-long skills to improve mental and physical health. Ask your GP whether this gentle, evidence-based, specially-adapted yoga course is appropriate for you. The 12 x 75 minute class course comprises of easy foundational yoga poses. Props such as a yoga block, blanket or belt are used to aid effectiveness and comfort. How does this yoga compare to other treatments? Compared iwth other quality research, the scientific results for this programme found yoga to be one of the most effective options available relative to other mainstream and complementary treatments. Lesson for lesson it is better than all other rigorously researched back health treatments. Yoga is mostly taught in groups and is therefore very cost-effective. How long does yoga work? 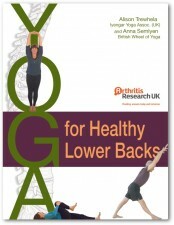 'Yoga for Healthy Lower Backs' programme works both short and long-term. Participants are helped to bring postural improvements and mental focus into their daily lives. Benefits were still found a year after starting yoga. 9 months after their 12-week course finished, the majority of the research trial's yoga group were praciticing approximagely 30 minutes twice a week at home. Yoga reduces sick leave due to backache and stress. Our research showed absenteeism reduced by approximaely 70% over a year (8.5 days) from this single 12-week course. Employers can arrange classes at lunchtime or after work. Participants learn yoga for pain-relief, healing and improvement of ther back health for now and the future. Aims are re-education and re-alinment of the body plus raised self-awareness. Poses include standing, sitting, kneeling and lying down with stable comfort. Please visit www.yogaforbacks.co.uk for further information. Please contact Rosemary if you are interested in attending a class.